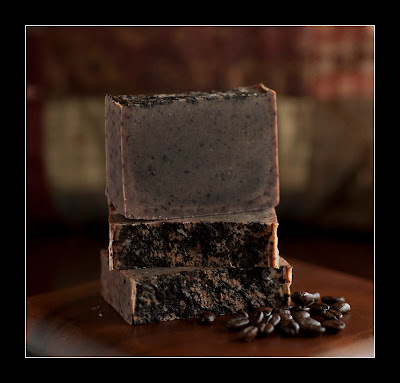 Anybody who knows me had to know it was just a matter of time before I found a way to incorporate coffee into my soaps. I LOVE coffee, but until I started researching healthy, all-natureal ingredients for your skin, I did not know that coffee could be used externally. Studies have shown that caffeine applied to your skin can actually kill the abnormal cells that cause skin cancer. It can also help rosacea by constricting blood vessels that cause the skin to flush. Perhaps one of the best uses for this soap is for deodorizing your hands after cooking. Coffee is said to be able to remove odors of garlic and onions from your hands, and the coffee grounds throughout the soap make it excellent scrubbing away dirt. You'll want to keep a bar of this by your kitchen sink.